Dr. Maithilee Kunda looks on as lab member Josh Plamer helps Jennifer Frist try her hand at one of the visual cognitive tests used in the lab’s research (photo: John Russell, Vanderbilt University). Her group’s research currently focuses on how we form mental images and use those images to reason about information and solve problems. The lab uses “cognitive systems” approaches from artificial intelligence (AI) to better understand how people glean data from mental images. Using AI to study mental imagery is different from (but complementary to) other research that focuses on an AI’s ability to recognize patterns in external images, such as detecting faces in pictures. Several research projects in the lab involve recording human test participants as they solve puzzles that use visual and spatial cues, analyzing how these participants go about solving each puzzle, then configuring cognitive AI systems to emulate these problem-solving strategies. 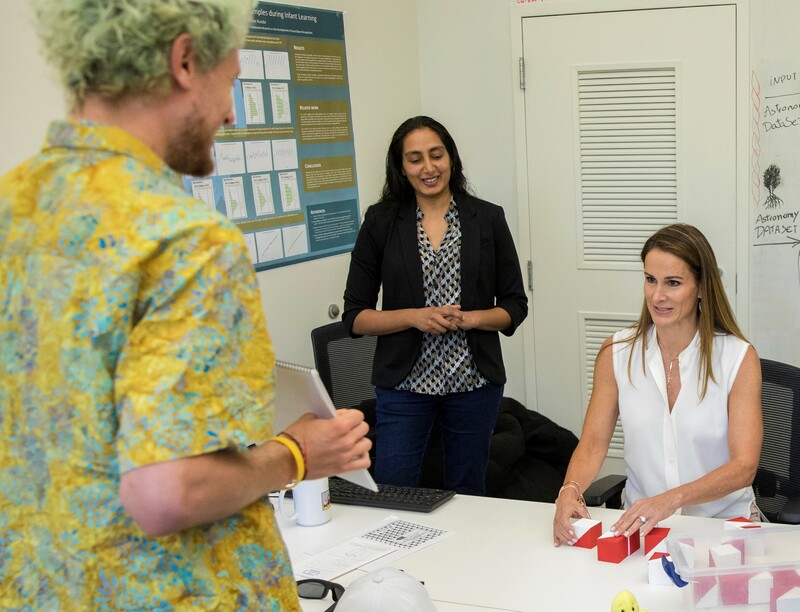 The lab’s research looks at the impacts of visual thinking on people throughout their lifespan, from how visual thinking evolves beginning in infancy to how adults might use visual thinking in the workplace, for example in data visualization tasks. The lab also studies how visual thinking can be measured, in particular by looking at ways to improve existing cognitive tests through innovative uses of technology such as “wearable eye tracking,” a head-mounted camera system that tracks the participant’s eye movements while solving a puzzle. One potential discovery that could impact the work of the Center of Autism & Innovation is identifying measurable differences in how neuro-typical versus neuro-diverse subjects solve complex problems. This could help in identifying talents such as superior visuospatial reasoning, useful for specific applications in industry such as inspecting goods or equipment for subtle differences that could be the product of a defect.